Lockheed Martin Recreation Association, 4:00 p.m. - 10:00 p.m.
3400 Bryant-Irvin Blvd, Ft. Worth. From I-35 take I-30 west to Bryant-Irvin. Turn left, building on right. 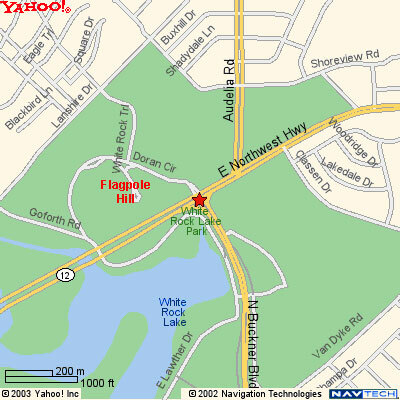 Or, from I-35, take I-20 west to Bryant-Irvin, turn right, building on left. $2.00 admission. Contact: Karen Jones 817-377-4744 or Brad Johnson (Unipsychos) 817-737-9828. Denton Civic Center, 1:00 p.m. - 7:00 p.m. Free public show at 7:30 p.m. (in the ampitheater behind the Civic Center, weather permitting). 321 E. McKinney St., in Denton. $4.00 admission. Contact : Logan Daffron 214-EAT-JUGL.